Sherlock Holmes and Doctor Watson are detective characters created by Sir Arthur Conan Doyle. According to the books, Sherlock Holmes and Doctor Watson lived at 221b Baker Street in London between 1881 and 1904. The building at 221b Baker Street is a museum dedicated to the life and times of Sherlock Holmes, and the interior has been maintained to reflect what's written in the published stories. The house is "listed" so has to be preserved due to its "special architectural and historical interest", while the first-floor study overlooking Baker Street has been faithfully restored to its Victorian-era origins. From Baker Street station, turn right, cross the road and turn right and you're only 5 minutes walk from the Sherlock Holmes Museum. Do make sure you see the Sherlock Holmes statue outside the station too. We walked past this museum for years and had wondered what went on inside, as the exterior looks more like a Victorian home with its black iron railings, black and white mosaic floor tiles and bay window with net curtains. When we did go in, we were surprised how busy it was, especially with overseas visitors. The entire ground floor is a fascinating shop so anyone can visit here without buying a ticket to go upstairs to the museum. Costumed museum assistants help to keep the Victorian-era theme going inside. The shop sells an amazing array of goods from deerstalker hats, pipes and magnifying glasses to jewelry and novelty teapots, as well as Sherlock Holmes books and films. There's no museum tea shop or cafe but there are customer toilets in the basement. Buy your ticket from the counter at the rear of the ground floor, then head on up to explore three floors of the museum. The rooms are dressed as if the characters still live here, and they display items from many of the stories that will make fans gasp with delight. On the first floor, you can enter the famous study overlooking Baker Street and you can sit in Sherlock Holmes's armchair by the fireplace, and use the props for photo opportunities. Sherlock's bedroom is also on this floor. The second floor features Doctor Watson's bedroom and landlady Mrs. Hudson's room. Here there are supposedly personal items of the detectives and Doctor Watson is there writing his diary. Up on the third floor, there are waxwork models of some of the main characters in the Sherlock Holmes stories including Professor Moriarty. There are stairs up to the attic where the tenants would have stored their luggage and there are suitcases there today. There's also a rather lovely flowery toilet. Did Sherlock Holmes and Doctor Watson ever really live there? Sorry to be the one to tell you but they are fictional characters created by Sir Arthur Conan Doyle. The building was recorded on local authority documents as a lodging house from 1860 to 1934 so that timing would fit well but there's no way of knowing who actually lived here for all that time. After seeing this museum, you would be forgiven for believing that Holmes and Watson truly did live here, as the curators have done a good job of dressing the rooms and collecting exhibits that could have appeared in the many stories. 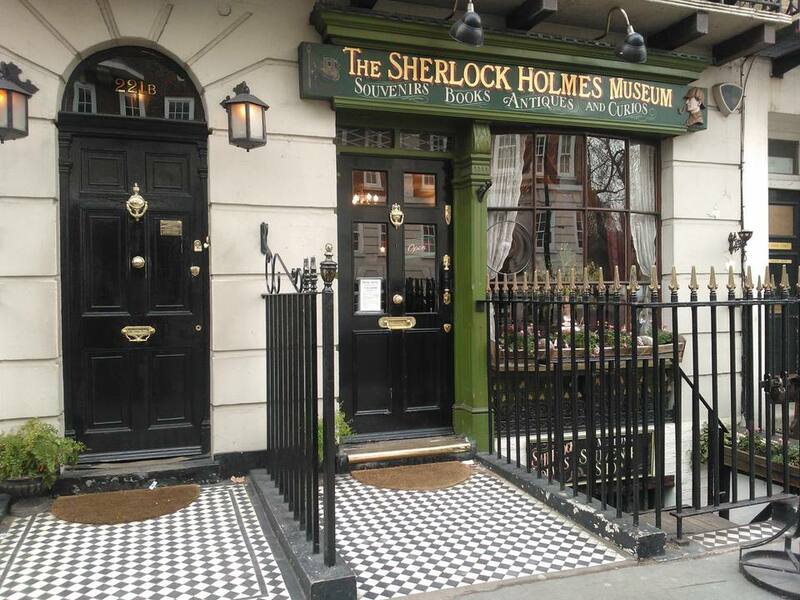 After visiting the Sherlock Holmes Museum you might like to jump on a Bakerloo Line tube from Baker Street to Charing Cross and visit the Sherlock Holmes Pub which has a small museum room upstairs and serves nice meals.